Professional, Dependable, Alternative to the Dealers! We are the premier dealer alternative for your European auto repair and service in Las Vegas. Our ASE certified technicians specialize in maintenance and repairs on BMW, MINI, Mercedes-Benz, Audi, Porsche, Land Rover, Jaguar and Volkswagen vehicles. Desert Oasis utilizes the latest in computer technology and brings the utmost in trust, quality and customized attention to your vehicle. Driving the finest machines ever manufactured, the level of prestige and status from owning these luxury vehicles is only matched by the level of detail and expertise found in our team of highly trained, certified and knowledgeable technicians. Our technicians strive to deliver perfection in all of our auto repairs and services, whether it is minor or major. We service and repair the following European automobiles (model years 2000+). From routine maintenance to major repairs, we have highly trained, certified and knowledgeable technicians, and we beat dealer rates! I took my car to BMW Service/Repair due to warning notifications and my engine shutting off on its own while driving/being idle. BMW recommended a repair which had nothing to do with the symptoms. Took it to Desert Oasis who found the correct solution to my problems. 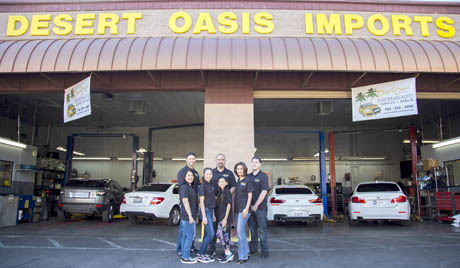 Desert Oasis is the only places I'm taking my cars to get serviced and repaired because they're honest, professional, and reliable. Thank you Desert Oasis. I think what they are charging for their services are very fair and they are honest. They are also efficient and respond to their customers in timely matter. I'll continue to bring my car to them whenever I need a service. I will never go to any other mechanic as long as I drive a Mercedes. They are always efficient, friendly, and amazing with the prices!! They even know me and my car when I call just by telling them my first name!! I love them!! Fully trust the service provided by Desert Oasis. Have brought my BMW to them since moving to Las Vegas. Always have explained what is needed and provided estimate. Always have called when they said they would call and gone out of their way to ensure that the work was done when they said it would be done. Great service at discount prices! Lowest Labor Rates In Las Vegas. | Experienced Technicians. | Professional, Dependable Alternative To The Dealer. | Free Shuttle Service. | Negotiated Rental Car Discounts. | Central Las Vegas Valley Location. | Serving Las Vegas For More Than A Decade. | We Work With All Insurance Companies And Extended Warranties. And more, just give us a call!